Chandigarh, the dream city of India's first Prime Minister, Sh. 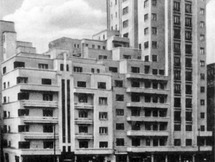 Jawahar Lal Nehru, was planned by the famous French architect Le Corbusier. Picturesquely located at the foothills of Shivaliks, it is known as one of the best experiments in urban planning and modern architecture in the twentieth century in India. Chandigarh became symbolic of the newly independent Indian. The foundation stone of the city was laid in 1952. The city is well known for its architecture and design by architects such as Le Corbusier, Pierre Jeanneret, Jane Drew, and Maxwell Fry. In the 50’s Le Corbusier was ask to develop the plan of Albert Mayer. Mayer started some years before with the first Master Plan for Chandigarh and contracted the Polish-born American architect Matthew Novicki, who died in an airplane crash 1950. The government officers of Punjab seized the opportunity to find a new team of architects and town planners. Le Corbusier was employed for the Master Plan and the Capital buildings and worked from 1951 until his death in 1965 on the construction of the city. Pierre Jeanneret, his cousin and partner was hired as the site architect. Maxwell Fry and Jane B. Drew worked for about three years on the project and then left due to their engagements elsewhere. In 1965 M.N. Sharma took over from Pierre Jeanneret as the first Indian Chief Architect of the Project and after the reorganization of the State of Punjab in 1966 and the establishment of Union Territory, Chandigarh, he was appointed as Administrative Secretary of the Department of Architecture in the Chandigarh Administration. The Master Plan by Le Corbusier was broadly similar to the one prepared by Albert Mayer and Mathew Novicki, except that the shape of the city plan was modified from one with a curving road network to rectangular shape with a grid iron pattern for the fast traffic roads, besides reducing its area for reason of economy. The city plan was conceived as post war ‘Garden City’ wherein vertical and high rise buildings were ruled out, keeping in view the socio economic-conditions and living habits of the people. All the main roads were straightened out, the dimensions and organization of the superblocks were reformatted, a complete hierarchy of circulation was established, the nomenclature was changed, and the Capital “head” was firmly located in place. The metaphor of a human being was being employed in the plan – the ‘head’ contained the capital complex, the ‘heart’ the commercial centre, and the ‘arms’, which were perpendicular to the main axis, had the academic and leisure facilities. The plan incorporated Le Corbusier’s principles of light, space and greenery. What had been named an “Urban Village” in Mayer’s plan, Le Corbusier renamed a “Sector”. Le Corbusier divided the city into different Sectors. Each Sector or the neighboured unit, is quite similar to the traditional Indian 'mohalla', and measures 800 metres by 1200 metres, covering 250 acres of area. The sector featured a green strip running north to south, bisected by a commercial road running east to west. The streets were organized in a diminishing hierarchy and labeled V1 through V8: V1: arterial roads that connect one city to another, V2: urban, city roads, V3: vehicular road surrounding a sector, V 4: shopping street of a sector, V5: distribution road meandering through a sector, V6 residential road, V7: pedestrian path, V8: cycle track. Each Sector is surrounded by V2 or V3 roads, with no buildings opening on to them and meant to be self-sufficient, with shopping and community facilities within reasonable walking distance. The educational, cultural and medical facilities are spread all over city, however, major institutions are located in Sectors 10, 11, 12, 14 and 26. The two Colleges, the École d'Art et d'Architecture from 1950-1965 are important buildings by Le Corbusier. Their studios and classrooms are grouped around interior courtyards. The buildings are severely oriented north and south, so that light enters from the north. The halls are separated by low partitions. Le Corbusier determined that these school complexes and the Museum had to be built of the reddish-brown brick that is common in India, or at least faced with this brick; in this way he sought to prevent buildings within sight of the Capitol from attracting too much attention from his prestige buildings of concrete. The industrial area comprises 2.35 sq kms, set-aside in the Master Plan for non-polluting, light industry on the extreme southeastern side of the city near the railway line, as far away from the Educational Sectors and Capitol Complex as possible. The city centre (Sector 17) is the heart of Chandigarh's activities. It comprises the Inter-State Bus Terminus, Parade Ground, District Courts, etc. on one hand, and vast business and shopping center on the other. The 4-storey concrete buildings house banks and offices above and showrooms/shops at the ground level with wide pedestrian concourses. The Neelam piazza in the center has fountains with light and water features. Sector 34 is another newly developed commercial sector. The roads were designed and oriented in such a way that most of the time during the day, they are under shadow. There are huge parking areas for the commercial zones so that the Parking problems don’t create a havoc on the main roads. Le Corbusier called it Les Sept Voies de Circulation, or 7Vs. The rationale of his planning was the motor car. "From his early studies in urbanism, Le Corbusier had identified the motor car as the central factor of modern town planning. His initial, primarily aesthetic, quasi-Futurist response to the motor car and to rapid movement in the cities had, by 1950, metamorphosed into a theoretical solution to the problems of modern traffic -- a graded system of circulation, from crossing continents to walking to the front door. The 7 Vs act in the town plan as the bloodstream, the lymph system and the respiratory system act in biology. These systems are quite rational, they are different from each other, there is no confusion between them, yet they are in harmony ... It is for us to learn from them when we are organising the ground that lies beneath our feet. The 7Vs are no longer the sinister instruments of death, but become an organised hierarchy of roads which can bring modern traffic circulation under control'." [Prasad Sunand, 1987]. Le Corbusier believed in creating harmony by using the Design principle of Symmetry. He designed clusters of bungalows. With each unit consisting of a simple arrangement of a veranda, two bedrooms, a kitchen, an open-air water closet, and an “Indian-style” toilet, each unit had open-air space in front and back as extensions of the house and was surmounted by a secondary parasol roof to keep it cool. “ It is the same principle which was employed in the large apartment blocks (the Unité at Marseilles for example)”, Le Corbusier noted, “where on the 17 floors the apartments are contiguous and of the same lay-out”. Chandigarh was Le Corbusier’s opportunity to fulfill his ideas, and he clearly projected onto India. Le Corbusier, however, was unable to execute his full image of a city. Other then the Master Plan, the actual housing of the city was not what he wanted it to be. Le Corbusier’s vision is contained in the archived transcription of a first meeting 1950. Le Courbusier peremptorily announced to the rest of the team: “My part of the work will then be build a “Block of Building”, a “Dwelling Unity” which already exists, that can be experimented on the spot and will be one of the many “Dwelling Unities” which you will build over there. I would like to construct one or two public buildings so as to make use of my personal experience”. “Dwelling Unity” is the English transcriber’s literal translation of “Unité d’Habitation”. Le Corbusier wanted to see more Unité in Chandigarh. His famous Unités were models of integrated vertical living. Lifted clear off the ground plane, they were designed to emphasize their relationship with the sun and the sky and their freedom from the ground. Le Corbusier couldn’t realize this type of Unité, large apartment blocks in Chandigarh. The Capital complex, Sector 1, comprises three architectural masterpieces: the “Secretariat", the "High Court" and the "Legislative Assembly", separated by large piazzas. In the heart of the Capital Complex stands the giant metallic sculpture of The Open Hand, the official emblem of Chandigarh, signifying the city's credo of "open to given, open to receive". The pools are being constructed in front of the High Court and the Assembly; those of the Government Palace are situated on two different levels. The Secretariat (1953) is a very large building and a 254 meters long and 42 meters high houses the ministerial chambers and all ministerial agencies. The Ministries are grouped in a central pavilion, Block 4, one of the six ministerial blocks, each separated from the next by a vertical expansion joint extending the full height of the building. The exterior is of rough concrete, that is to say, the vertical brise-soleil, the parapets and the horizontal brise-soleil, the acroterium which stands out against the sky leaving visible the rooftop accommodations which are to be used for a club and for receptions. The two large ramps in front of and behind the building, serve all floors and are likewise in rough concrete. They offer a very beguiling solution of the circulation (morning and evening) for the 3.000 employees. Vertical circulation is ensured by batteries of ele­vators matched by a staircase running in both directions encased in a vertical spine rising from ground level to the summit of the roof. Rough concrete similarly caps the two end walls bringing out the effect of the standard sheet-metal formwork. The block of ministerial offices has been the object of very careful research in regards to the sculptural relief given to rough concrete by the effect of diverse types of brise-soleil. The rough concrete again interposes in the fenestration of the two main façades : more than 10.000 units of a unique design -one stanchion type 27x7 cm in section and 366 cm high constitute the "undulatory glazing". This concerns an appli­cation here of the Modulor which permits the stretching of a veil of glass extending the entire length and height of the building, interrupted by elements called "ventilators" which comprise a shutter of sheet-metal pivoting vertically from floor to ceiling across an opening of 43 cm and capable of being opened to any desired width, from 1 millimeter up to 43 centimeters; covered, in addition, by a curtain of copper mosquito-netting. Thus, an enormous saving of money and maintenance was realized with this fenestration, when compared with wood or metal. The Modulor has; dictated the basic section of the office types in the building (3.66 meters of height under the transoms) permitting a harmonization of the heights of the ministerial chambers by a doubling of proportions and has given to blocks 5 and 6, which rest on pilotis at park level, a play of height of true eloquence (entrance level to the Ministers' pavilion, level of ministerial offices and the pilotis of blocks 5 and 6). The 3.000 employees of the Secretariat arrive by bus, bicycle, or on foot, and (have different accesses depending upon whether the route which they take from the city is the “Boulevard of the Waters” or the "Valley of Leisure". The automobile network is entrenched throughout the park of the Capitol, thus excluding vehicles from the visual field of the casual stroller in the park. The Parliament or Legislative Assembly (1955) was designed as a large box with the entrance portico on one side, concrete piers on the other, and a repetitive pattern on the façade. Sculptural forms on the roof, a dramatic ‘funnel’ top light over the Assembly, and a tilted pyramid over the Senate chambers completed the composition. The Assembly Hall has a square plan. The Assembly chamber, in the form of a hyperbolic shell, is surrounded by ceremonial space. This circulation space is planned as a dimly lit, triple height, columned hall for informal meetings and discussions. The side of the hall facing the high court has a great portico and has eight thin piers. These piers frame a view of glimpses of the Shivalik Hills. A ceremonial pivoting door is placed in an off-centre bay of the portico. Le Corbusier was inspired by the form of the cooling towers of a power station near Ahmedabad. The architect designed the hyperbolic shell of the Assembly chamber with a base diameter of 39.6m. This shell is 38m and terminates in an oblique section with a metallic framework at the top. This framework directs the interplay of natural and artificial lighting, ventilation, and acoustics. The hyperbolic shell is only 15cm thick, which helped in reducing the cost and the weight of structure. The Assembly chamber has a seating capacity for 252 persons. Additional galleries are provided for ladies, journalists, and officials. Acoustical treatment has been given to the Assembly Chamber to modulate and control the sound levels by providing sound absorbing panels in bright colours and random curvilinear shapes. The Council chamber, with a capacity of 70 seats is crowned by a pyramid, which admits light from the north into its interior. A ladies gallery with 90 seats, a men’s gallery with 104 seats, and a press gallery with 24 seats are also provided in this chamber. Staircases, lifts and ramps provide various means of circulation and access to different levels of the building. 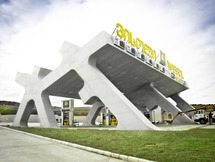 The construction of the entire structure is in exposed reinforced concrete. The High Court (1952) has been in use since March 1956. The approaches have not as yet been prepared : two of the three basins of water have not yet been excavated in front of the Palace; the exterior polychromy is enlivened, for the moment, on the principal façade, only by the brise-soleil of the Courts of Justice; the three pylons of the grand entrance portico, coated with a cement rendering, are to be painted-one green, the other white, and the third in red-orange, both left and right walls to be painted black. The 650 meters of tapestry, completed in five months by Indian craftsmen in Kashmir busy since the inauguration of the building, for the lower parts of the small High Court (eight tapestries of 64 m2 each) and for the lower portion of the large Court of Justice (a tapestry of 144 m2) provoked the delighted acquiescence of Mr. Nehru and the Governor of Punjab as well as the Chief Judge. But they also aroused doubts in the minds of some judges who declared that they were an outrage to the dignity of justice and caused two or three of them to be removed. Thank you! Keep on rocking! sorry for risponding a bit late. I found one of the sources, but it surely has more. I will try to find out. But then it can also happen that someone edited the article and added his/her own infos. In that case you can use it. I find this article very interesting and very helpful. My master's thesis regards the city of Chandigarh. In the article I found many useful information, which I like to use in my thesis. I have deep respect to the copyright. I would like to present the source of the information, but I can't find the information about author of the article. Is it possible to receive the name of the author? Thank you for your help. This architecture The beginning of learning Modern architecture from the west of me.